(Nanowerk News) Researchers from the University of Bern, using an observatory on board a jumbo jet, have observed how the extrasolar Planet GJ 1214b is passing in front of its star, causing a kind of mini-eclipse. The first measurements of this kind with the observatory called SOFIA (short for Stratospheric Observatory for Infra-red Astronomy) prove that the flying observatory is well-suited to the observation of exoplanets. 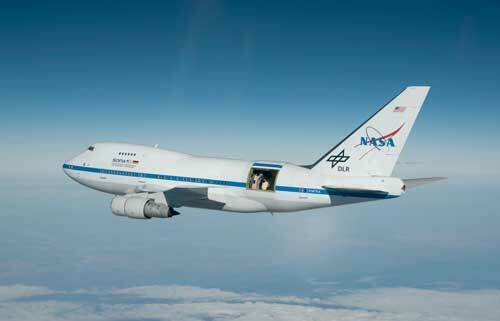 SOFIA is a 2.5-metre telescope, built into a Boeing 747-SP – an American-German project. "The observatory flies somewhat higher than commercial aeroplanes," explains Daniel Angerhausen of the Center for Space and Habitability (CSH) of the University of Bern: "In this sense, SOFIA is a space telescope that returns home every morning." The CSH researcher had already completed several test flights, but the most recent observations have been unprecedented. "For the first time, we were able to use all the instruments available on SOFIA to research my speciality: transits of extrasolar planets," explains Daniel Angerhausen. When, from our vantage point, a planet outside the solar system passes directly in front of its parent star, the planet occults parts of the star and makes it a little darker as in a mini-eclipse. Part of the starlight, however, passes through the planet’s atmosphere before reaching us. This light can provide information about the composition, temperature, pressure and other characteristics of the planet’s atmosphere. "When we observe these transits from the ground, even from the best locations in Chile or Hawaii, the light not only passes through the exoplanet’s atmosphere, but also that of the Earth, which jeopardises our readings", explains the scientist: "That is why it is so important for us to get up high with SOFIA." The observation target was GJ 1214b, a type of super-Earth or mini-Neptune. This class of medium-sized exoplanets occurs relatively frequently – but not in our solar system. Here there is not a single example. With their observations, Daniel Angerhausen and his international team, which also includes the CSH researcher Daniel Kitzmann, gathered data to find out whether GJ 1214b is more of a large rocky planet or a shrunken Neptune made of gas or ice. The researchers have now published their measurements in the journal Astronomy & Astrophysics ("Simultaneous multicolor optical and near-IR transit photometry of GJ 1214b with SOFIA"). "Our results give some new clues, but no final knowledge about the nature of GJ 1214 b," summarises Daniel Angerhausen. What is more important for him about the latest observations, however, is that they prove how suitable the flying telescope is for the researching of exoplanets. "With the instruments, we were able to almost reach the theoretical limit by a factor of one-and-a-half to two", says the expert: "The sensitivity is thus sufficiently high for SOFIA to be able to play in the exoplanet transit league in future, together with the Hubble and Spitzer space telescope." Although SOFIA is unlikely to become a hard-working first-team regular like those two, it may be used for special moves and to fulfil special tasks that would otherwise not be solved. Daniel Angerhausen is already looking forward to hunting exoplanets on many future stratospheric flights.